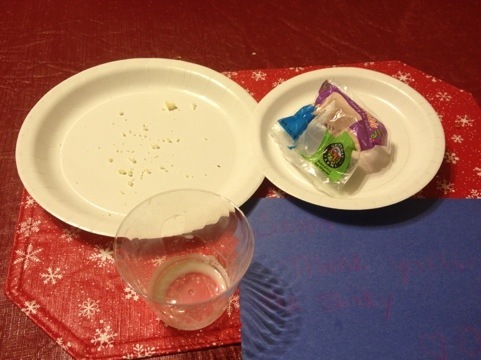 As a parent one of the things that I’ve come to enjoy most about Christmas is the purging that comes after. 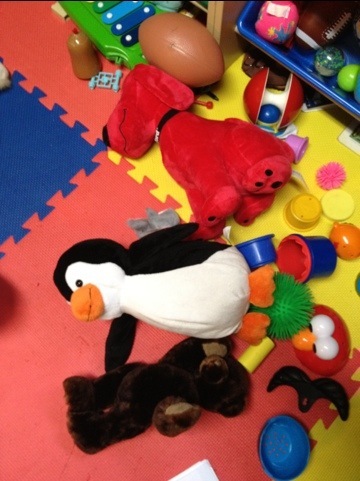 In order to find room for all our new toys we clear out the old, unwanted and just plain annoying toys. In clearing out our old clutter I just can’t help but think of kids who don’t have as much as we do. Like most people who donate we tend to box things up and drop them in one of many donation boxes around our city. However I know that new lead laws have made it harder for some thrift stores to resell toy items and I’m not sure it’s the best way to give back. 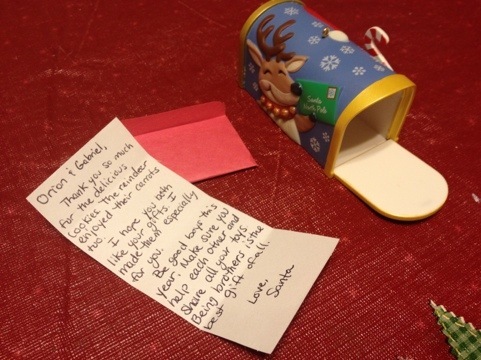 Some charities and thrift stores like the Salvation Army won’t even accept used toys anymore. The problem is every toy on the shelves needs to be lead free which takes time and money to figure out which toys are and which toys aren’t. Any toy made and sold on store shelves after 2009 will be lead free in accordance with the lead laws. Even if you know your toys are lead free the stores reselling them have to be sure. So I did a little thinking and a little research and came up with a list of places you might be able to donate your unbroken and gently used toys. SO I propose the first week in January should be National Donate a Toy Week. Don’t feel guilty. Just do it! I know we’re going to start by asking friends and our favorite daycare providers if they need any of the toys we’re ready to let go of. 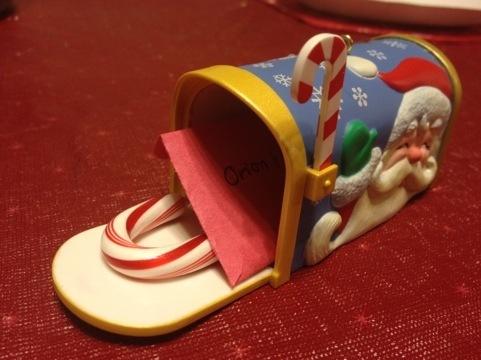 My mom made this cute mail set for my son for Christmas. I just had to share because it’s so cute and he loves opening all of his special letters from grandma. My mom is actually following me on Pinterest and had seen that I had pinned one similar to this. 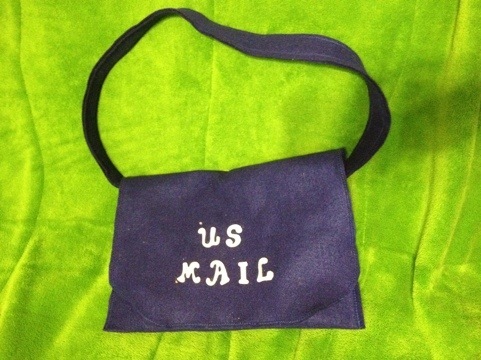 She made the mailbag out of felt and the envelopes are made out of a heavy fabric. 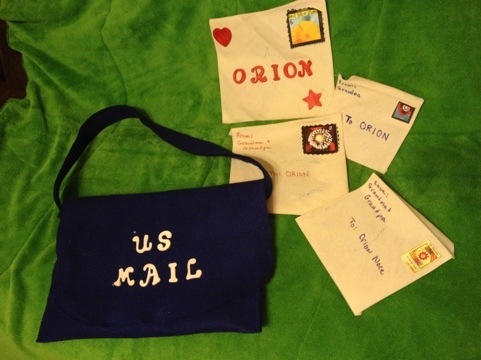 Inside the envelopes are letters from grandma, hearts made out of felt, and a notebook she made for him. So sweet and such a great gift. Every year I get tons of compliments and questions about my Holiday Cards. Like most people with kids I get the photo cards. There are tons of websites to choose layouts from. I usually browse several sites until I find the card that I want to use. Sometimes I have the picture first. This year I picked out the card first. We just had a birthday party in November for our son Gabriel who just turned one. The birthday party was a magical woodland theme with gnomes and fairies. I’ll be posting more about the party after the New Year. I spent probably an hour online looking at different card designs. In my browsing for the perfect card I found one that had gnomes on it. 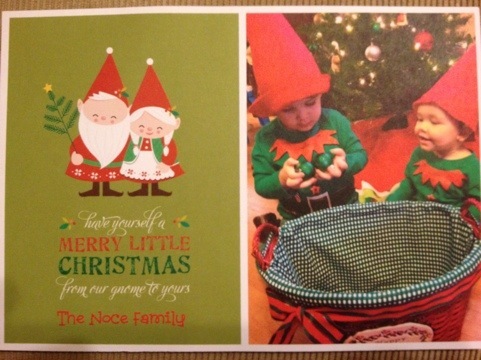 The caption read “Have yourself a merry little Christmas from our gnome to yours”. I had my card all I needed now was the picture. 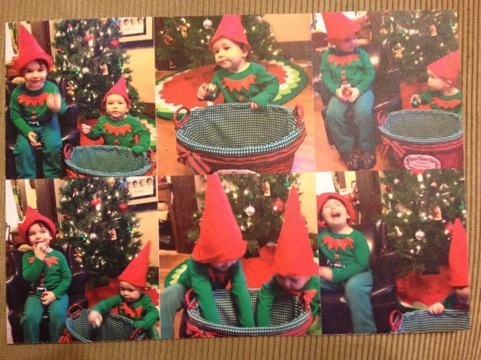 So I dressed my boys in elf shirts and had them wear gnome hats that we had left over from the party. To keep them occupied and in the frame I bought a basket and filled it with plastic ornaments and other Christmasy items to keep them busy. I picked what I thought would be the best time of day for my kids which was after breakfast. Its early enough in the day that they’re well rested and after breakfast so they’re bellies are full. When taking pictures of my kids I don’t like to use a flash I think the pictures turn out better so I made sure there was enough light. Then I just took as many pictures as I could to ensure my chances of getting a good one. I also selected the option of having the back of the card be a collage of some of my favorite out takes, which for me makes the card. We had so much fun making our cards and even more fun sharing them. Blend everything together except for the chocolate chips. You can use a blender or a food processor. When it has a smooth consistency mix in the chocolate chips and serve it with pretzels, graham crackers, or cookies. 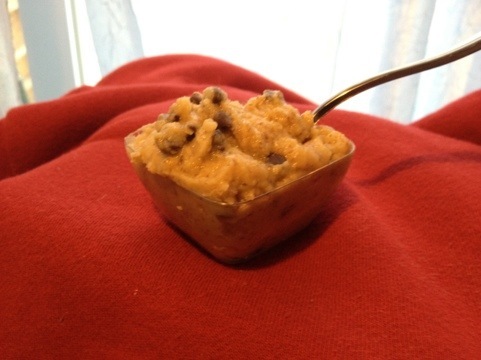 No one can believe that this cookie dough dip is made with beans! 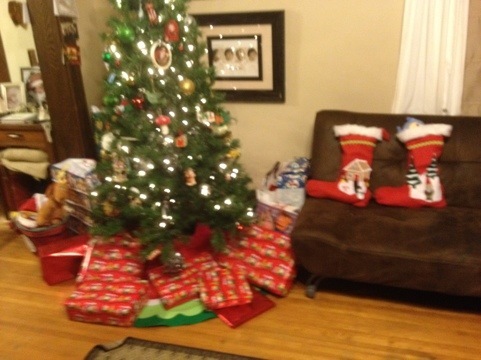 This year for Christmas eve we wanted to be home with our kids and keep things simple. My three year olds new favorite food is pepperoni pizza. I decided to make pizza, i just couldn’t help making them a little bit special for Christmas. 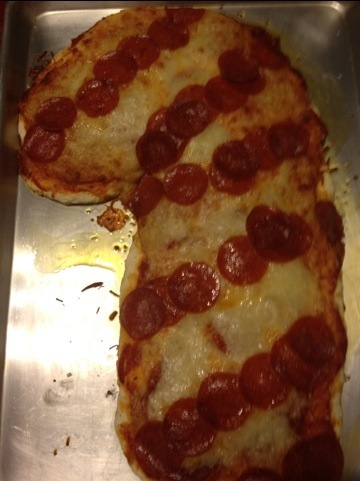 So I made pepperoni pizza in the shape of a candy cane for the kids. 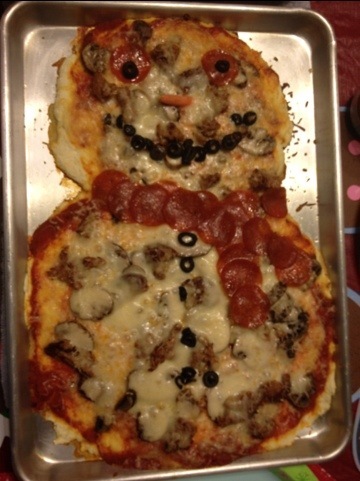 For the adults sausage, and mushroom snowman pizza with a pepperoni scarf and olives for his face and his buttons. For anyone interested in my gluten free crust I used a mix by Ogran. I did not follow the directions on the box. Well really I did everything but the yeast mixture. All gluten free pizza dough mixes seem to come out really heavy to me so instead of the water and yeast I added eggs to lighten up the dough. For two boxes of mix I used three extra large eggs. It worked well the dough was very light. We should get one thing clear pizza dough is one of those things that will never be the same gluten free you just can’t get that chewy consistency in the dough without gluten. That being said you can still make good pizza just don’t expect it to be exactly the same. This was the best dough I’ve made yet. The candy cane pizza was a huge hit. I hid extra pepperoni under the cheese. 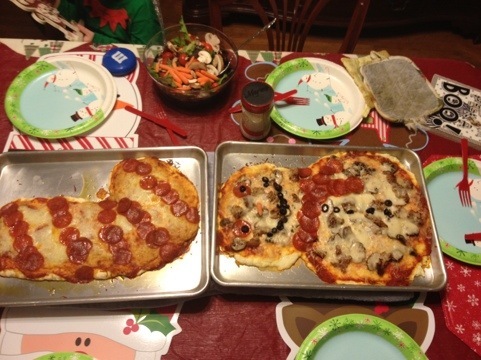 Orion had fun helping me decorate the pizzas and showing them off to everyone before they went in the oven. The grandparents seemed to enjoy theirs too and snowman pizza doesn’t have to be just for Christmas I could see making these all winter long. I made these coconut chicken bites for Christmas and I honestly had a hard time getting enough on the plate to get a picture. People were eating them as fast as I could make them. I used boneless skinless thighs. I pounded them flat and cut them into strips. 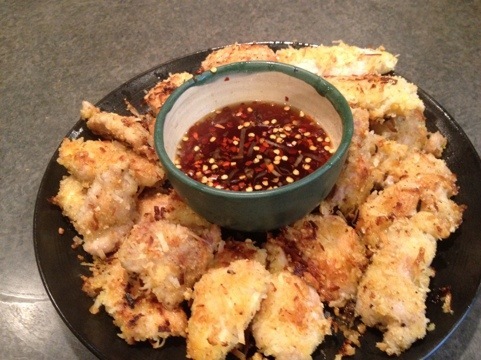 Then I dipped the pieces in egg and rolled them in a mixture of half shredded coconut and half panko bread crumbs. I used gluten free panko. I heated up my skillet with a little olive oil and fried my chicken. You could adjust the amount of heat by adding more or less chili. These were so good there wasn’t a single one left on the plate at the end of the night. 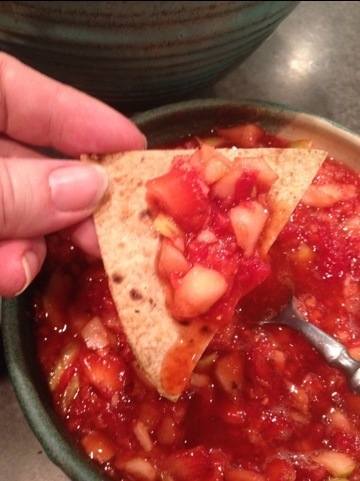 This fruit salsa is so delicious I would eat it everyday on everything I could think of. It was also so easy. Rough chop all of your fruit. You could chop it in the food processor or if you had something like a magic bullet. I have a hand crank chopper I bought from Tupperware that’s what I used. 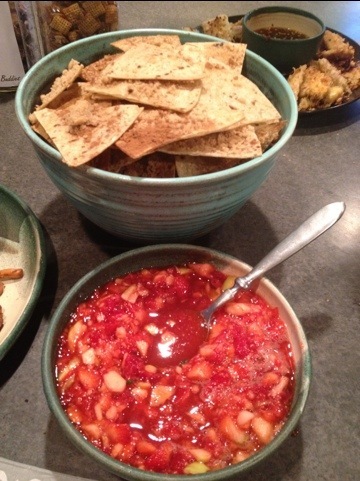 When your fruit is a good salsa consistency just add the rest of your ingredients and stir. 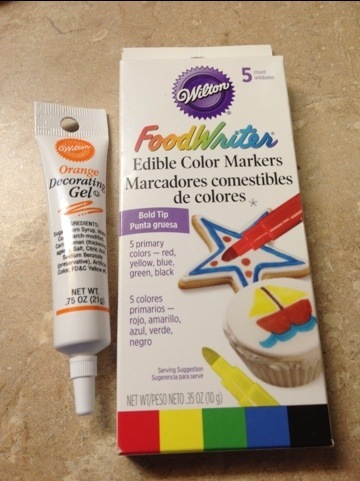 You could serve this with cheese and crackers or apple chips or maybe cookies or crackers. I made my own gluten free chips by cutting gluten free tortillas into triangle shaped slices. You could also use regular flour tortillas. I layed them out on a baking sheet sprinkled a good amount of brown sugar and cinnamon over them and baked them in the oven on 350 degrees for about 15 minutes. 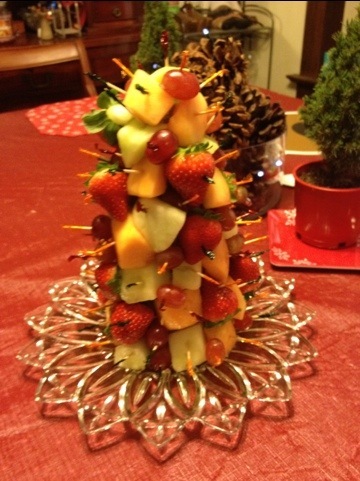 These were a big hit at Christmas and are definitely going on my list of recipes to make again. They say the devil is in the details, but sometimes so is the magic and the joy. Sometimes it’s the little things that make all the difference. 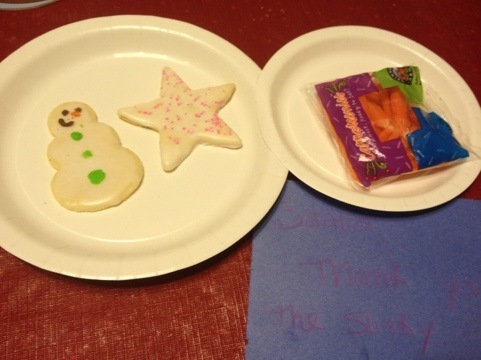 Like most families we have begun to create these small holiday rituals that make all the difference. 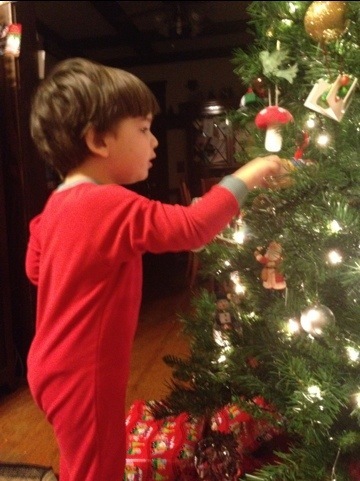 Some of our most favorite traditions are included in the pictures posted below. 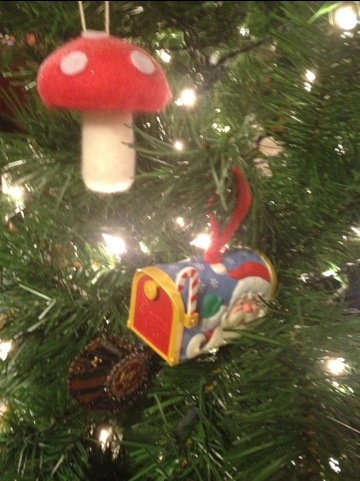 I hope everyone is having a joyous holiday! I’m always looking for fun ways to make the holidays a little bit healthier. This little tree is so cute… Healthy too. The kids loved pulling the fruit off the tree at brunch on Christmas eve day. For Christmas eve brunch with cousins I made a special batch of home made hot cocoa. I used one can of sweetened condensed milk, about 4 cups of whole milk and one cup of chocolate chips. If you want to flavor your cocoas you can use a teaspoon of extract. Peppermint cocoa is delicious or orange. 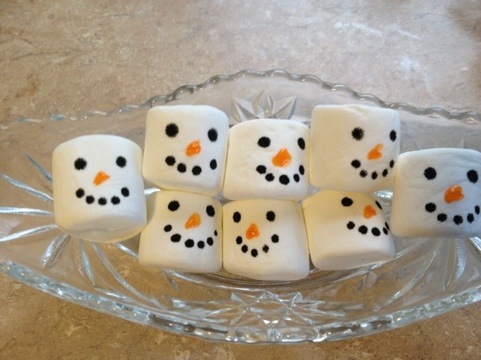 Then to make it even more special I made snowman faces on the marshmallows using a black food marker and orange icing. The kids loved it.